Pegasus looked so thin and hungry. If he had food in his belly, perhaps he would have the strength to pull the cart. That way the cab driver wouldn’t take him to be butchered. She crossed the road, dodging carts and carriages and men pushing barrows, back to the man selling fruit. Without waiting to make sure his back was turned, or his attention elsewhere, she grabbed three apples, tossed them into her kettle and dived back into the traffic. It is 1808 and Grace’s life is hard. She spends her days as a mudlark, sifting through the muddy bottom of the Thames in search of anything her cruel uncle can sell. Her only pleasure in life is a horse called Pegasus who she visits when she can. But when Pegaus’s life is in danger, Grace takes a terrible risk, and soon is sentenced to transportation to Australia. Previously published as four separate books in the Our Australian Girl series, The Grace Stories traces Grace’s adventures in London, on the journey to Australia, and as she makes a new life in the colony. Bound in hardcover with a magnetic clasp, this is a sturdy collectable edition which will delight history-loving readers. Grace screamed as men grabbed at her legs. She heard whistling and shouting and then she fainted as she fell, half-dragged, into the arms of a runner. When she came to, the policemen hauled her into a cart. Grace didn’t need to ask where she was going. She already knew. To the gallows to be hanged. It is 1808 and orphan girl Grace lives in London, surviving by working daily as a mudlark – scouring the muddy bottom of the Thames for things to sell. Her one joy in life is watching the horses on Fleet Street. But one day Grace’s hunger gets the better of her and she steals an apple. Even her horse friend can’t save her from being arrested, and soon she finds herself in prison facing the possibility of a death sentence. Meet Grace is the first of four stories about this convict girl and forms part of the Our Australian Girl series from Puffin books. The series traces the lives of four girls in different periods of Australian history, with each girl the heroine of four books, and each set of four written by an eminent Australian author. 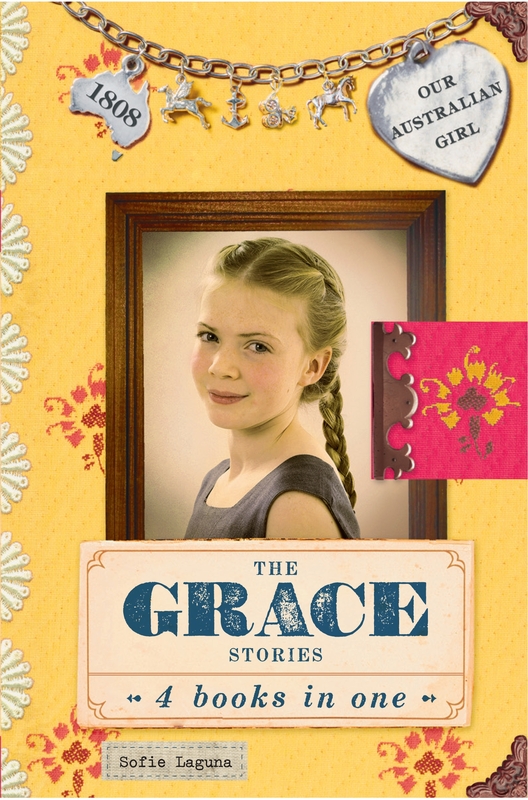 Meet Grace not only introduces Grace, enticing young readers to sek out the next instalment, but is self-contained enough to be satisfying on its own. Wherever she goes, everyone tells Lily Hippo she is too loud. At home they say “too loud”. At school they say “too loud!” Even her best friends think she’s too loud. Poor Lily! But when a new teacher called Miss Loopiola comes to school, Lily decides to be in the school play. With Miss Loopiola’s help, Lily learns that sometimes loud is what’s needed, and her family and friends see that sometimes Lily is not too loud. Too Loud Lily is a funny new picture book from author Sofie Laguna. With a simple message of acceptance and understanding, the lively text is well complemented by the equally lively illustrations of Kerry Argent, who portrays the telling emotions of Lily and those around her delightfully. Too Loud Lily will appeal to children from birth to six years of age, and their parents and educators. Sofie Laguna is an actor and writer, whose other publication credits include My Yellow Blanky and Bill’s Best Day. Kerry Argent’s previous illustration successes include Wombat Divine and One Woolly Wombat. This is Yellow Blanky. We go everywhere together. Eevry child can relate to the experience of owning a special blanket or toy which spells security and familiarity. In My Yellow Blanky, the special item is, predictably, a yellow blanket. The child (delightfully unnamed and of an indefinite gender) loves the blanky, especially the special smells it harbours – smells that encompass all of the child’s experiences. But, when Mum takes the blanket away for a wash, something happens to those smells. The delightfully simple text (little over 200 words) of this title will appeal to preschool aged children and also be accessible for the beginning reader. It would be an excellent bed time story, with its gentle action and message of security. The beautiful colour pencil illustrations of Tom Jellett complement the text perfectly – the rich pastel tones giving a warmth which echoes the story’s message. Sofie Laguna comes from an acting background. My Yellow Blanky is her first picture book. She is also the author of Bill’s Best Day, an Omnibus Solo.